Mercedes-Benz Sprinter Transfer 316 has a four-cylinder turbo-diesel with 120kW – more than ample power for a fully loaded trip. Mercedes-Benz Vans is a full-range supplier of vans and related services in Australia, with the very first MB van sold in Australia in 1998. Since then, the brand has experienced steady growth; 2017 was a particularly impressive year, yielding 15 per cent. The first Sprinter Transfer was introduced to the market locally in 2006, and this test drive would help us discover why this van boasts growing market popularity. Mercedes-Benz is a well-known, easily recognisable and much respected luxury brand. To date, however, despite experiencing a continually increasing market share, it still faces stiff competition from the historically dominant Toyota HiAce. "The minibus market has remained steady over a long of period of time, with an average of 2700 units per annum and 1 per cent year-on-year growth," Mercedes-Benz Vans PR and corporate communications manager Blake Vincent says. "It’s been a market which has historically been dominated by the Toyota HiAce bus with 92 per cent market share but we have seen more competitors enter the space. The Sprinter Minibus now occupies just over 10 per cent share of the market and we had share growth of 3.3 per cent last year in what was our biggest sales year ever." 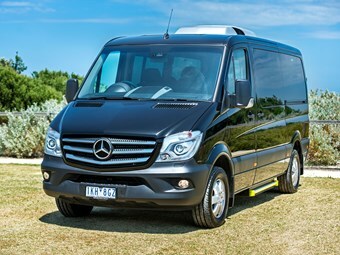 The Mercedes-Benz commercial segment comprises the Sprinter large van, chassis and minibus and the Vito mid-size van. "Originally we had a heavy focus on the commercial categories, but have since evolved to provide products and services for private customers, as well with products specifically designed for their requirements. We also have a brand-new Sprinter launching at the end of this year, which will ensure the Sprinter continues to lead the large van segment in the future, with more variants and more customer driven solutions than ever before." Main customers of the Sprinter include tourism operators, local councils, school transfers, aged care facilities airport and hotel transfers and company work sites, it's claimed. "Our vehicles offer a high level of convenience and functionality, drivability and comfort – we like to say our vehicles work like a van and drive like a car," Vincent says. At first glance, the 12-seat Sprinter Transfer 316 showcases a sleek black paint job and a large Mercedes-Benz symbol on the grille. Before even stepping foot inTO the Sprinter, you expect that it’s going to be a quality drive. The tinted passenger windows are a $555 optional extra, but look perfect against the black exterior. It has a 4-cylinder turbodiesel with 120kW – more than ample power for a fully loaded trip. The electric sliding door makes passenger access easy. It’s a great safety feature for customers – no more heavy sliding doors. As the door opens, the step automatically extends out. "No exertion is required from the passengers – it can be simply opened through the push of the button, or via pressing the key remote. It’s also a very safe way for passengers to exit and enter the vehicle," Vincent says. There is a handrail in front of the closest seat near the side exit door; another safety feature for the passenger closest to the door and for people entering and exiting the van. Not only are the passenger seats generous with room, the rear luggage section would easily accommodate a full load. This was a very impressive test drive of a great-looking van; the Sprinter Transfer 316 drives and handles more like a car. Blind-spot monitoring on the driver's and passenger-side rear-vision mirrors was a great feature. A light warns you when a vehicle is in your blind spot - this feature would be great for busy city driving. Another handy feature in both traffic and long hauls is the lane-departure warning system, which alerts when you are leaving your lane. One small criticism would be the rear-view mirror that, arguably, is too small. Perhaps a larger one for more vision along both sides of the van - and of my passengers. Overall, the Sprinter well and truly lived up to expectations of what a Mercedes-Benz van should deliver. This model is standard with 7G-Tronic 7-speed fully automatic transmission. Its comprehensive list of safety features startS with the ESP9i stability control program and includes electronic brake distribution and brake assist, traction control, rollover mitigation, load-adaptive control, cross-wind assist and trailer stability control. Four-wheel disc brakes are also included, along with front driver and passenger airbags, and a reverse camera is standard. "The level of safety features that we offer as standard and optionally is class leading; our 2.2-litre four-cylinder engine has proven itself as a very reliable and long-lasting choice," Vincent says. "We have the only 12-seater bus to be offered with a fully automatic 7-speed auto torque-converter transmission. It is the same transmission used on other Sprinter models and has been used across our passenger car portfolio. It is incredibly reliable and robust, improves fuel consumption due to the low gear ratios used, and improves the overall smoothness of the ride. "With the 316 you add more power with the 120kW/360Nm engine output. All Sprinter models are equipped with Blue Efficiency technology, which is fully optimised to lower emissions," he says. All components are fitted at the Mercedes-Benz factories in Germany. There are no Australian-made components to this model. The Sprinter also offers a range of metallic and non-metallic paint colours, chrome grille, a high-roof option, 16-inch alloy wheels, light and rain sensors, Bi-xenon headlamps, halogen fog lamps, additional panelling in the cabin, Becker Map Pilot navigation, Parktronic parking sensors and a higher-performance rear air-conditioner that runs off its own compressor. "As you would expect with all of those features, we are very strong on safety and design. Then, of course, there is the passenger comfort. This is a 12-seater that can be driven on a standard driver’s licence and the seating layout and available payload means there is plenty of space for the passengers and their luggage. A rear air-conditioner is also included, which does a great job of keeping everyone cool in the back." The Mercedes-Benz brand "acts as the business card", according to Vincent, as he outlines the company’s service and support options. "Mercedes-Benz has a range of tailored service plans, which can include parts, so the cost of servicing is transparent and can be set to the customer’s preference. The vehicle is backed by a three-year or 200,000km warranty, and service intervals are set at one year or 30,000km. "A lot of the time we find people want to buy a Sprinter Transfer Minibus, but need bespoke seating or configurations to suit their specific needs, like wheelchair access. "The bus pack allows customers to get local bus builders to do the fitout here. The package comes with the basic fittings and a customer can meet their specific seating requirements. We find that is a great way to help meet our customers’ needs," he says. The price point for this model is AUD$79,990 plus on-roads, versus the 313, which is AUD$64,990 plus on-roads. At AUD$64,990, the 313 specification has been set to allow it to be more competitive on price while still offering all the key features customers require in this segment. With the launch of a new generation of Sprinter vans due at the end of this year, Vincent says: "Mercedes are excited for this new model platform to be released. With new technology it’s very innovative, has a large range of variants, and has customisable options to meet our customers’ needs. "We have a very passionate dealer network. We feel a lot of our success is because of the good work that they do," he says. We are looking forward to seeing the new generation released later in the year and, with the past year’s increased market share, it will be interesting to see if with the new model Mercedes can better the great current growth figures in future.